This brand new real-time engine now powers all our apps. Not only will you see your latest uploads appear in real time on all platforms, but views count, newer versions of files that have been updated, comments, and notifications will update concurrently. We’ve heard from some users that often they need more time to record tutorials and demos and the 5 minutes recording time in the Jumpshare Plus plan is not enough. So today, we’re removing the limit and offering unlimited recordings at no extra cost. Many users prefer sharing GIFs to get their point across. GIFs are easier to embed, be it Slack, email, website, or anywhere else. We’ve completely overhauled it to ensure the GIF is smaller in size, loads faster, and has better quality. The option to record your screen in GIF has also been added to the top bar for quick access. By default, the GIF recording is set at 6fps which is optimal. If you’re looking to change, you can choose between 3fps, 6fps, or 12fps quality from Preferences in both Windows and Mac apps. Users who’ve moved to high-resolution DPI displays reported that their screenshots and screen recordings did not look as good. Either the resolution did not come out correct or the mouse cursor was offset. We’ve updated our Windows app to make it compatible with High DPI screens. There were a few issues our users faced when running High Sierra – the screen recording interface froze after recording, the Blur tool in Annotation no longer worked, and some other small bugs. We’ve fixed all of these issues and also overhauled the entire Jumpshare popover window UI for faster speed, stability, and performance. Over the past few months, we’ve seen a lot of interest from our users for the Business plan that offers better team collaboration features, more space, more public download bandwidth, team management, consolidated billing, and customization options. The Business plan is scheduled to launch before the end of this year and we’re working around the clock to make it available to you as soon as possible. We are discontinuing all older versions of the apps next month. 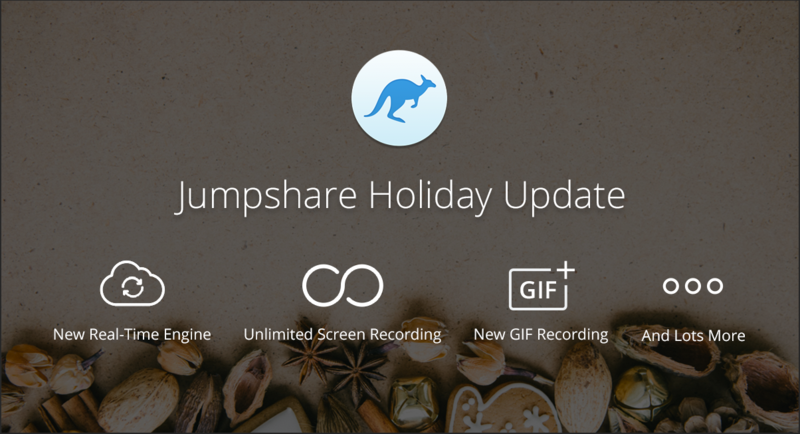 To continue using Jumpshare, please update to the latest version of Mac, Windows, and iPhone apps by December 11, 2017. If you’re already using a recent version of our apps, you should receive an update shortly. If you don’t see the update, please get the latest version by clicking the Download button below. Feel free to contact us if you have any questions. Cheers! We will be back soon with more!